Actually, what I am interested in is understanding the original intended meaning of the Popess. So, not generically "some of the people some of the time", but the inventor of the trumps, when he added this card to the deck. I think that the interpretation documented by Michael and Ross, who see in the Popess and in the Empress two allegories taking part in sponsus-sponsa couples with the Pope and the Emperor, is the one that makes most sense. Moreover, as you write, it was a popular subject in the Middle Ages. First, I did not include the Pope-Church relationship as husband-wife as part of what was "popular". I only said that church documents could be found then that supported this relationship as a legal entity; I am not sure what exactly, but I think it was between the Pope and the property of the Church as an institution. There is perhaps also a contract of obedience between the Pope and his bishops, priests, nuns, etc. But that is not a marriage. And property isn't a sponsa. Please explain. And if you have any pre-1450 pictures showing a Popess and a Pope in marriage, please share them. I only know Christ and the Bride, mystically the ascended Mary or the human soul. 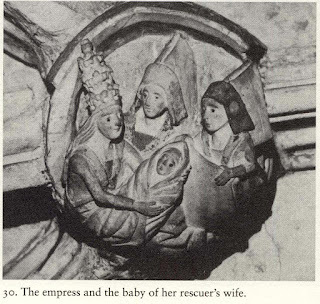 I know of 15th century pictorial representations of Mary as the Church. But there is no marriage to a Pope in such pictures, just an implied relationship to Christ. I understand the relationship between the Emperor and Empress as a marriage. I understand the relationship between Christ and his Church as a metaphorical or spiritual marriage between Christ and the community of believers. I do not understand the relationship between the Pope and the Church as a marriage in any real or metaphorical sense (except as a legal contract). Your quotes have the Pope as the vicar of Christ, that is, his representative. In relation to marriage, the analogy might be with the proxy that Emperors sometimes sent to stand in for them to legalize a marriage when the bride was too young for anything else. But the bride is not married to the proxy. "Legal representative"--or even "spiritual representative"--and "allegorical representative" are two different things. Perhaps it will be clearer if we look at the relationship in the context of the "inventor" of the Popess card, who may not have been as picky as I am about understanding relationships. Someone might say that the inventor of the tarot made the Church the Pope's wife simply to suggest the close bond between the two, Pope and Church, and nothing more. What is the merit of such an idea? To answer that, we have to examine who the inventor might have been and how he might have thought, not in terms of what makes the most sense in our own post-Renaissance terms, but in terms of the actual facts of the milieu of the earliest known tarot and of the interpretive schemas current in that milieu. "Common sense" is no substitute for facts, however complicated they might get. I presume the invention to be sometime between 1410 and 1462, with the earliest known being the PMB, sometime between 1552 and 1462, If you want, we can stipulate that it was created between 1438 and 1462, although I myself would not make that assumption. I am not clear whether by "inventor" you mean the inventor of that card, the inventor of the trumps as a whole, or the inventor of the Popess plus other cards, but not the whole. I will assume the first of these, but in the context of other trumps before and after in a sequence. What can we say about the inventor's intentions? All we can do is extrapolate from known facts of that time. We know that in 1440 a notary named Giusti paid a shop in Florence for a deck that he had had made for a condottiere and lord of Rimini named Sigismondo Malatesta, who married a daughter of Francesco Sforza in 1442 and in 1460 was declared a heretic by the Pope (http://en.wikipedia.org/wiki/Sigismondo ... _Malatesta). We know that sometime before 1447 Filippo Visconti had a deck made with at least 11 trumps (the Cary-Yale). Something similar (the Brera-Brambilla) was made for someone else, but without heraldics. We know about 14 figures in Jan. 1440 (1441, new style). We know about a deck of trionfi purchased in Ferrara for the d'Este court in 1442. We know that a deck was purchased by a notary in 1453 Florence for his own use. We know that the PMB first-artist deck was made for the Sforza in Milan. We are pretty sure that the Catania trionfi were made for Alessandro Sforza, Lord of Pesaro, in either the early 1450s or early 1460s, probably in Florence. We know that decks of 70 cards were made in 1457 for the Ferrara court. There is speculation that in Bologna and maybe Florence there was a deck with 4 similar looking figures representing authority-figures and assumed all male, looking much like the later Bologna cards; if so, the second figure has a wimple, which is a female-only bit of attire (so how anyone can say that it preceded the Popess card is a mystery to me [see http://www.rosscaldwell.com/images/taro ... ries01.jpg]; it seems to me more logical that they left the wimple and the key when they got rid of the Popess, so that people who really wanted to could use the new cards to play the old game). In the early 1460s the Charles VI deck was commissioned, probably for a wealthy family such as the Medici. I think that covers the time up to the first known Popess card. There is a clear pattern here, namely, a courtly and humanist milieu, and certain families, especially the Visconti-Sforza but also the Estensi and maybe the Medici. Notaries were the rank and file of humanism, as Ullman says in his biography of Salutati. Florentine governmental bureaucracy was dominated by humanists, starting with Salutati as Chancelor 1375-1406, then Bruni and Poggio. The Milan and Ferrara courts, known commissioners of decks, also had leading humanists to tutor their children and serve at court. There is no indication of Church involvement. In fact, documentation from Church sources suggests that many Church people, at least Franciscans (like Bernardino) and Dominicans (like Savonarola and the author of the Steele Sermon) were against cards in general and tarot in particular. Who in this situation would be the "inventor" of tarot trumps? It seems to me that it would not have been the actual artist or artisan who painted the cards. 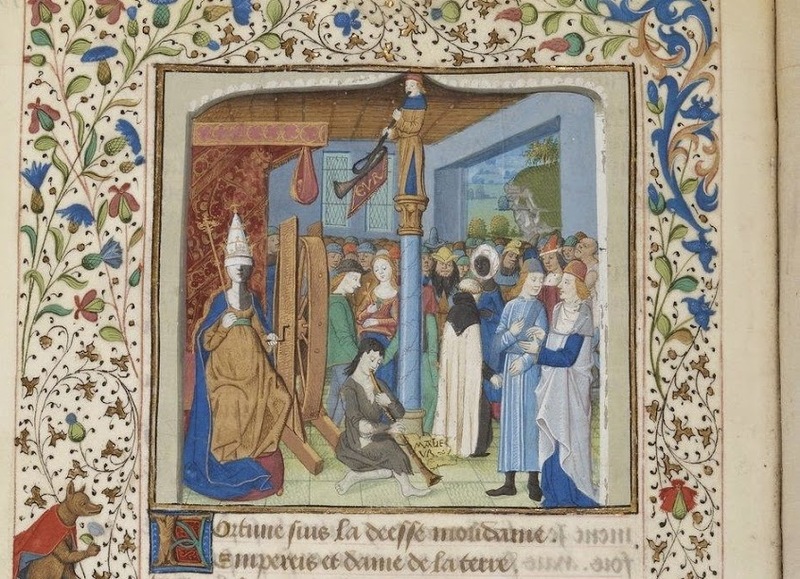 While they would have had images from various sources in their model books, they were not skilled in the techniques of allegorical composition. Also, they would not have spent time making a new series of images if they didn't know if anyone was going to pay for them. Art was by commission. Commissioners were in the beginning people with extra money, but neither the time nor the expertise to develop sophisticated visual allegories. They had humanists for that. We have the example of Marziano to look at, with the game he proposed in 1420s Milan. He submitted a plan to Filippo Visconti and Filippo paid Michelino to do the work. Michelino was not the inventor. The inventor was Marziano, a humanist, as approved or modified by Filippo. That is the way it went in Renaissance courts, unless the proposed art was for a church. Then the program was probably determined by a Church appointee and most steps along the way approved by church authorities. There is no question but that the Popess was conceived as in some way related to the Papacy, and hence the Pope card, due to the Papal tiara on the PMB figure.The only question is what the relationship was understood as. That it is the same as Emperor/Empress, or that of sponsus/sponsa in a Christian context, is not a given. In fact, Also, when it is trump 2, the Popess is rather distant from the Pope at trump 5, giving play to other associations, namely with the Bagat and the Matto. The Popess card, given that there was no real person with that title, likely falls into the category "allegorical". But "allegory" meant different things to different people. Realizing that I didn't know much about how allegory was conceived at the time, I started reading The Cambridge Companion to Allegory, 2010, a rather long and dense book from which I will try to extract short selections. I apologize for the length, but I don't know of any previous discussion on the subject here that I can assume people know. What follows took me a long time to research and write. But it at least makes sense to me. Here it is important to remember that the word allegoria transferred from Greek into Latin, carried two rather different meanings. When used in late antique Greek sources, it bore a theurgic value, relating to the concealment of divine or cosmic meanings, close to its value as "symbol". But in Latin, it had acquired a restricted literary or rhetorical sense of inferring another meaning than what is said. The word in Christian theological contexts carried the force of the Greek theurgic meaning, but was still susceptible to interference from its Latin rhetorical meaning (see in this volume Most, "Hellenistic Allegory" and Struck, "Allegory and Ascent in Neoplatonism"). All poetry is by definition allegorical. The Florentines, picking up from the late antique Neoplatonists, would later concur with this view. Poetry essentially requires obscurity. One's approach to the hidden meaning, however, varied, depending on the lapse of time that separated the interpreter from the text. Boccaccio assumed he could recover Dante's intention in the Commedia, but both writers agreed that an ancient poet's intention could not be recovered. In that case, Petrarch said he would not give the opinions of others. New readings are acceptable as long as the letter brings them and they are true. One must allow the possibility that the author had another reading in mind... Boccaccio will state ancient opinion and, where that fails, his own. He adopts the learned approach. It is further a drama of Everyman. For the Iliadic Aeneid Petrarch drops all personal names. It is not Latinus, Amata, Turnus, and Aeneas but husband, wife, local, and stranger. Petrarch reads these figures psychologically, as symbols of passions that Aeneas must strive to control. In his flight from Troy, Aeneas loses his wife Creusa, that is, he loses the habit of pleasures. At Carthage, Aeneas dozes on the poop of his ship, a situation which indicates that his mind sleeps till he makes a firmer choice and sails off. Dido then cremates herself, or shameful pleasure perishes by itself...High places signify reason...Darkness indicates mental and moral ignorance, and death signifies the extinction of a passion in the soul. Here for Aeneas we are entitled to read "Everyman"; so the whole poem is allegory. We don't have a commentary on the tarot, but we do have one for another game that was quite similar, Marziano's explanation of the game he proposed to Filippo Maria Visconti. For Marziano the gods are grouped in four categories, virtues, riches, virginities, and pleasures, conceived in terms of more and less esteemed qualities. The higher, meaning virtues in relation to riches and virginities in relation to pleasures, overcome the lower, in regard to gods of otherwise equal rank. An allegorical difficulty is that riches, a less esteemed quality, overcomes virginities, a more esteemed one. Also, the gods' ranking does not seem to have all the gods of one category above those of the less esteemed category, but only one each in pairs; rank takes precedence (http://trionfi.com/martiano-da-tortona- ... -16-heroum). The tarot can be seen as having the same principle except without a division into four; in its 22 card version, there are cards suggesting vices and adversities (e.g. Time, Fortune, Death, Devil, Tower) as well as virtues and favorable situations. In relation to the Popess, we have just had Foolishness and Deceit (on this level of allegory). The virtue associated with books is Prudence, sometimes Wisdom. However the place in the sequence, second out of 22, might modify that assignment. It might be, for a young person, teachings needing to be taken on faith, and perhaps, in response, treated merely as formulas to be memorized, so as to satisfy one's teachers. But for a humanist the teachings would seem to be more than just those of the Church, even for a young person. Moreover, the Church tended to communicate orally, in preaching and in the confessional, rather than in books. I wonder how many visual representations of the Church at that time had her with a book. I will have to check. Petrarch and Boccaccio incorporated euhemerism into their notions of allegory. A historical event or series of events became one of the secrets hidden behind the veil of fiction. These secrets were either elusive and personal or historical and public. In the way he read some of Vergils eclogues Servius provided the model for the first category, and Petrarch and Boccaccio would give similar explanations for their own Latin pastorals. So in Petrarch's Bucolicum carmen (346-57) Silvius and Mincius in Eclogue One stand for Petrarch and his brother Gherardo. [Footnote: Petrarch so explains this eclogue in a letter to Gherardo (Familiares 10.4, in Le Famliari ed. Vittorio Rossi (Florence: Sansoni, 1926). Another example Murrin gives is a comment by Spenser, where he explicitly says that in his Faerie Queen the figure of Gloriana "shadowed Elizabeth as queen" while Belphoebe shadowed her "as private person" (p. 175). For historical personages, there is the example of Boccaccio's reduction of the gods and goddesses to actual historical persons, Isis as a queen of Egypt, Ceres as Queen of Sicily, etc. (http://books.google.com/books/about/Fam ... j04ULC0s8C). Marziano does the same in characterizing his cards. The figures are not really gods but deified heroes, corresponding to real persons in the forgotten past noteworthy for particular qualities. I think it is reasonable to expect that the same kind of meaning might attach to certain tarot cards: the Popess, the Hanged Man, the Lovers, and the Hermit might have personal meaning in the family of the Visconti-Sforza, as well as the lady on the Chariot card. That is especially suggested when there are family heraldics on or near them. So might a Knight of Batons on a White Horse, and the same horse and ride on the Justice card; such a combination also appears most famously in the Medici's Processsion of the Magi, another good place for applications to particular real persons. If the young man on the horse is Galeazzo Maria Sforza, then Justice would be Bianca Maria. I think it is interesting that Boiardo's game-poem easily fits the same structure as the Marziano. Besides a trump suit (this time with 22 cards), there are four suits, two "good" and two "bad", with accounts of people in the thrall of passions and overcoming them or not with virtues. It also designates specific historical personages, Biblical and Greco-Roman, as subjects. That suggests to me that Petrarch and Boccaccio expressed a standard humanist way of thinking about allegories. Not surprisingly, Murrin finds Boiardo's Orlando Inamoranto a good example of Renaissance allegory (p. 170). But that comes later than the invention of the Popess card, so I will skip it. The two methods of interpretation, ethical-psychological and are not exclusive. Both can operate at the same time, as obviously with Marziano and Boiardo's game proposals. In all cases where they were used, personifications functioned in a manner opposite to allegory. A figure like Excess, who sits at the inner gate or porch of Acrasia's garden, requires no interpretation. It is the necessity of interpretation that makes a personification allegorical, in the Renaissance. (I have quoted the whole passage in my preceding post.) What makes Justice, etc., allegorical in the 15th century tarot is its hidden meaning as part of a narrative defined by the sequence; in Spencer "it was the story, not the personifications, that made the allegory" (Murrin p. 176). A third type of allegorical interpretation that Murrin discusses is the Platonic. In the early 15th century, this method is defined in Chapter 2 of Macrobius and is the basis of much pre-scholastic philosophical allegory, of which the first part of [i[Romance of the Rose[/i] is a late example (Companion p. 119f) and, in one way of looking at it, the Divine Comedy. Marziano's game fits this model only vaguely. For each pair of gods, there might be an ascent from pleasures to virginities (chastity) and from material riches to heroic virtue. But that isn't much; also, from virginities the sequence ascends to riches; and then after a god representing a heroic virtue we are back to pleasures again. Tarot doesn't have this division into four and perplexing hierarchy; it starts in lack of reason, ends with judgment day, with virtues and adversities in between. That is rather like a Macrobian/Ciceronian ascent, or perhaps descent and ascent, through the planetary spheres. In this model the Popess could be seen as part of the descent of the soul into this world, the imparting of Wisdom that will be forgotten at birth. Or it could be seen as part of the Hell of this world, as the first stage of Dante's poem, and the Church and one's tutors as oppressive institutions which nonetheless contains a germ of Wisdom in the message they convey. (This is an application of Landino's analysis of Dante, which I will talk about next.) After these early figures (trumps 1-5 or 0-5) comes the overcoming and purgation of the vices, making the soul suitable for its heavenly destinations (seen in the last five or six cards). In the Renaissance, the Platonic approach was felucidated as an interpretive schema by the Florentine Landino in 1480 (p. 166). Landino found two senses to the Aeneid, the literal or political, which concerns the active life, and the allegorical or purgative, which concerns contemplation. Dante presented the two senses successively, the political in the Inferno, the purgative, of course, in the Purgatorio, and then added a third in the Paradiso: the virtues of the soul already purged. The purgative sense is original and redefines the moral virtues in a Platonic fashion, Man is mind, but the body poisons the soul through its passions. Hell, therefore, is this world, which explains why the Inferno concerns political virtue, since a trip to hell is really a study of humankind here on Earth. Macrobius is the key Latin figure in transmitting a distillation of the Greek traditions of allegorical reading and divination to the Western Middle Ages. Iamblicus' use of the term symbol, to mean a representational device that exceeds simple imitation and operates instead by synecdoche, borrows from two ancient contexts: the symbol as a magic talisman (such as is widely attested in the surviving magical papyri), and as a passport to higher states of being in the mystery religions and Pythagorean cult, a use which dates back to the classical period. Could the Pope and the Popess allegorically be Christ and the community of believers? (That is a question I at least understand.) That depends on how these figures are interpreted allegorically in the sequence, Here the numbers are important. 2 and 5 are different orders from 4 and 5. It depends on what makes sense in an allegorical narrative. which includes Emperor and Empress, not simply as human beings married to each other, but as allegorical signifiers (for e.g. material nurturance and material authority, as opposed to spiritual nurturance and spiritual authority). For more on this topic see Decker's The Esoteric Tarot and my posts at viewtopic.php?f=12&t=971&start=10#p14194 and the two following. In closing it is important to note that this theory of the symbol is the only strictly literary theory attached to the term that survives from antiquity...The Stoics use it as a synonym for enigma (aenigma), the most powerful conceptual engine of ancient allegoresis, and Porphyry, as was also mentioned, used the symbol as his central concept of figuration in his treatise. But no literary thinkers before Proclus document their theories of it. I have emphasized the Iamblichean background, but Proclus also refers directly to the Pythagoreans, magicians, and mystery religions that lie behind Iamblichus. This saves Platonism from banishing poets like Filelfo from its Republic. But any relationship, or lack of it, to 1450s Milan is quite speculative. In fact, more generally, the issue of the inventor's intent seems to me highly speculative, and in part irrelevant to the meaning of the card. I do not think the inventor's intent is the whole of what gives a card meaning; for me something else is needed, not participation of the cosmos but rather a social milieu using the cards with a shared system of references. (I am in that sense an Aristotelian; but there is a part of me that is also Platonic: in a psychological sense, meaning can outstrip such shared references.) That Bianca Maria and her children were up to snuff on their Proclus I doubt (and it might have been dangerous for Filelfo to promote such things). The conditions probably didn't exist until Ficino. If an inventor wishes to control the interpretations, he can write a commentary such as Marziano and Boiardo did. However these games didn't prove popular. It is precisely in not having such a commentary, yet also with obvious familiar meanings up to a point, that the deck is most interesting to humanists and the general public alike. There is admittedly the possibility that the commissioner of the cards that first included the Popess did not use a humanist at all. In that case the meaning might have been less sophisticated and grounded in established methods of allegoresis. If he liked the Pope, he might have included the Popess as the Church so as to indicate the close bond between them, and allegory be damned. If he didn't like the Pope, he might have had a less reverential intention, to imply some mistress, or to refer to a female on the throne of St. Peter, either historically or as something in the future. Such possibilities are not those most indicated by the facts, which indicate a humanist milieu and intention. They are merely possibilities. And once placed in a humanist milieu, they would have been quickly displaced by the humanist perspective. For all these reasons, given that we really don't know when, where, or by whom the tarot started, including the Popess card, what the inventor's philosophical background was, what his attitude to the Papacy was, and given that the inventor's intention is just one factor among others more knowable, I am more comfortable talking about particular manifestations of the Popess card in particular places at particular times than speculating about its inventor. Yet given that the card came into being in a very limited frame of possible times and places, it is indeed possible, thanks to some scholars' researches on allegory, to make some generalizations that would likely apply, indeed testable and confirmed in Marziano and Boiardo, and for that I am grateful to Marco for raising the issue. mikeh wrote: I do not understand the relationship between the Pope and the Church as a marriage in any real or metaphorical sense (except as a legal contract). this text, which seems to be by Thomas Aquinas, discusses the subject. I hope it will help you understand why “the Pope, who is the vicegerent of Christ throughout the entire Church, is called the spouse of the universal Church.” (Contra impugnantes, pars 2 cap. 3 ad 22). "Christ, the Pope, the bishops, and the priests are but the one spouse of the Church". The argument is substantially the same as the later texts I previously quoted. This mystical marriage is about the generation of spiritual children. "Papa" means "Father": the pontiff is still addressed as "Holy Father". The Church ("sancta mater ecclesia", Holy Mother Church) is the Mother. The believers are the children. "strictly speaking, the Spouse of the Church is Christ, of whom are spoken the words, “He who has the bride is the bridegroom” (John iii. 29). He, by His Church, begets children to bear His name. The other so-called spouses are in reality the servants of the Bridegroom, who co-operate with him exteriorly in this work of spiritual generation, but who do not beget spiritual children for themselves [but for Christ]. Although they are but ministers, they are termed spouses, because they take the place of the true Spouse. Hence the Pope, who is the vicegerent of Christ throughout the entire Church, is called the spouse of the universal Church. In like manner a bishop is termed the spouse of his diocese, and a priest of his parish. But at the same time the Pope is the spouse of every diocese and the bishop is the spouse of all parishes within his see. But it does not follow from these words that there is in one church a plurality of spouses. For priests assist their bishop in his work, and bishops cooperate with the Pope; he finally is the direct minister to Christ. Thus, Christ, the Pope, the bishops, and the priests are but the one spouse of the Church." sponsus Ecclesiae, proprie loquendo, Christus est: de quo dicitur: qui habet sponsam sponsus est, Ioh. III, 29, ipse enim de Ecclesia suo nomine filios generat. Alii autem qui sponsi dicuntur, sunt ministri sponsi, exterius cooperantes ad generationem spiritualium filiorum; quos tamen non sibi, sed Christo generant. Qui quidem ministri intantum sponsi dicuntur, inquantum vicem veri sponsi obtinent. Et ideo Papa, qui obtinet vicem sponsi in tota Ecclesia, universalis Ecclesiae sponsus dicitur. Episcopus autem suae dioecesis, presbyter autem suae parochiae. Unde et dioecesis sponsus Papa est et episcopus parochiae. Nec tamen propter hoc sequitur quod sint plures sponsi unius Ecclesiae; quia sacerdos suo ministerio cooperatur episcopo tanquam principali, et similiter episcopi Papae, et Papa ipsi Christo. Unde Christus et Papa et episcopus et sacerdos non computantur nisi unus sponsus Ecclesiae. Thank you, Marco, for continuing the discussion. I now see why a Thomist wouldn't have the problem I raised about the Pope-Popess relationship standing for Pope-Church. It still sounds illogical to me. He goes from "is called" to "is". That's the same as arguing that a proxy-groom, since he is called the groom, is the groom. But if it comes from Thomas, it doesn't have to be logical, I guess; it becomes doctrine, at least for Dominicans and most scholastics. Now that we are discussing Thomas, we have to talk his language. Does Christ-Universal Church, or Pope-Church, become the "allegorical" meaning of the Pope and Popess cards, or are the cards a literary "trope" for the relationship of the Pope and the Church?. Thomas allowed allegory in the sphere of theology, in reference to scripture, but not poetry or the other arts (quoted in Turner p. 80). Unfortunately my local library's copy of Eros and Allegory is checked out, or I would give you the refernce in Thomas. Turner comments that "implicit here is the distinction needed between theological allegory and literary trope." Turner gives the example of the Song of Songs, which would for Thomas be considered figurative rather than allegorical. Turner concludes, "In this sense of 'literal,' then, the literal does not contrast with the metaphorical at all; rather it includes it. However, "In scripture alone is allegory proper to be found". What Thomas excludes from readings of poetry are interpretations that are not figuratively implicit in the words: "Anything at all that can be said to be contained in the meaning of the words of a text is part of its literal sense." What is excluded are other meanings, different from what is part of the meanings of the words of a text. So I can see why a Thomistically inclined rich person might have sponsored a card game in which the Popess was a metaphor for the Church, because Thomas endorsed the sponsa-sponso, Church-Pope relationship, and anyway the two had a close, affectionate relationship. As I have said, I admit that the inventor could have intended the Popess as the Church. He could just as well have been someone angry at a pope and intended the Popess as the mistress. In discussing possibilities, either makes sense, without looking at the facts relating to the milieu of the early tarot. I say this because I think the facts don't support a Thomist view of the cards. Let me be as clear as I can: by "Thomist view of the cards" I don't mean a view that holds that the literal meaning of the Popess card is the Church. Probably it was not only a Thomist view that the Church was the wife of the Pope, in a metaphorical sense. By "Thomist view of the cards" I mean a view that holds, in non-scriptural contexts, that only the literal meaning, including metaphors, counts. That's the view that I think isn't supported by the facts. What the facts indicate is a humanist milieu for the early tarot and a humanist inventor in that milieu, in a court context (where the Pope, by his secular power and influence, is at least as much a threat as a blessing). Humanists would have been well aware of the issues I have mentioned. Most would have disagreed with Thomas about allegory outside of theology..Their heroes, Dante and Boccaccio and Petrarch, went out of their way not to follow Thomas on allegory. Dante, who surely had read Thomas, explicitly said that poets engage in allegory (http://msuweb.montclair.edu/~furrg/mel/convivio.html). I say ... that the interpretation should be both literal and allegorical. For the understanding of this, it should be realized that texts can be understood and should be explicated primarily on four levels. The first of these is called the literal level, the level which does not extend beyond the letter of the fictive discourse, which is what the fables of the poets are. The second is called allegorical, and is hidden under the cloak of these fables, a truth disguised under a beautiful lie; as for example when Ovid says that Orpheus with his lyre made the wild beasts tame, and caused the trees and the stones to move, this means that the wise man with the instrument of his voice makes cruel hearts tame and humble, and causes the wills of those who do not have a life of learning and art to be moved (for those who do not possess the life of reason are like stones).  . . . Of course, the theologians understand this sense in another way than do the poets. But because my purpose is to follow the mode of the poets, I understand the allegorical sense as it is used by poets. Dante in the Convivio drew on its usage, listing the four levels of interpretation but then distinguishing his own usage from that of Aquinas and the scholastics. The third sense is called the moral, and it is this one which teachers should seek out with most diligence when going through texts, because of its usefulness to them and to their pupils. One may discover, for example, from the Gospel, that when Christ went up to the mountain to be transfigured, he took only three of the twelve disciples with him. This may be interpreted morally to mean that in the most secret affairs we should have few companions. I assume that he means that one should not reveal the most important things to many, because one's words will be misunderstood and misused. It is the same point that Macrobius made about the mysteries. Surely Christ did not intend that his transfiguration be kept secret; it is an interpretation that goes against the literal meaning. These are not literal interpretations, even allowing for trope. Examples are also in Petrarch's Secretum, in which Petrarch's persona interprets "King Aeolis" releasing the winds as anger and the passions, but also controlling reason; the sky is the soul, etc. This is not the interpretation of poetic metaphor. And he has Augustine reply "I approve of these meanings hidden in the poetic narrative", even "if they were the farthest thing from his [Vergil's] mind" (quoted in Anne Dunlop, at http://www.academia.edu/2027420/Allegor ... d_Petrarch, p. 87; that essay is also of interest for its account of a revisioning of Giotto's Virtues and Vice done in Ferrara, c. 1350s, still extant). A euhemerist interpretation of the Popess, of course, would be a particular Popess, Joan, public, or Manfreda, "elusive and personal"--and not part of the literal meaning of the card, whatever it was. It [The Platonic viewpoint] automatically alters the very definition of the virtues because it changes the goal, which is now the mind's disengagement from this world. That the theological as well as the moral virtues were part of the Cary-Yale suggests something similar. In the first half of the 15th century, the humanists tended to side with Dante, Boccaccio, and Petrarch in favor of multi-level interpretation. In the Cary-Yale, such multi-level allegory is also evident (search "levels of interpretation" in my discussion of the CY Chariot at viewtopic.php?f=11&t=917&start=60#p13592). What the Ludus Triumphorum has to do with Petrarch is a matter of contention, but surely by 1441 if not earlier the perception was that the game and the poem were expressing something similar in their own way. Neither Petrarch nor many other humanists were in accord with Aquinas regarding literal and allegorical meanings, and that applies to the tarot Popess as well..
Added later: a half hour after posting, I changed the last sentence slightly and added a paragraph in the middle beginning, "Let me be as clear as I can", which I felt might be needed. After Plethon's dethroning of Aristotle in 1438, Aquinas would have been even less fashionable, since he was usually considered the Christian Aristotle. I don' think it was that clear-cut or abrupt, as many Humanists constantly sought to find a syncretic solution between Aristotle and Plato, including Filelfo whom you have been touching on a good deal lately (and of course don't forget Raphael's 'Athens' fresco where the two Greeks are on equal footing). While his translations of Plato were some of the best before Ficino (per Hankins, Plato in the Italian Renaissance, 1990: 401f), see his late publication attempting to reconcile Plato and Aristotle, De morali disciplina (1474), as discussed in Diana Robin - Filelfo in Milan: Writings 1451-1477, 1991: 49-66 and 226-46. "After Plethon's dethroning of Aristotle as "the Philosopher" in 1438, and Cardinal Bessarion's subsequent defense of Plethon's views on that subject, Aquinas would have been even less fashionable. He and the other scholastics had emphasized Aristotle over Plato, while Plethon, Bessarion, and others put Aristotle in the second position." I agree that those who supported Plato typically also supported Aristotle. They saw no contradiction between the two, but put Aristotle in a subordinate position. (I am not sure whether that was Ficino's view, but it was Bessarion's and Pico's, for sure, and yes, I would expect Filelfo's.) My impression is that the scholastics, including Aquinas, emphasized Aristotle over Plato (as described, e.g. by http://plato.stanford.edu/entries/aquinas/). That's something someone like Filelfo wouldn't have agreed with. Aquinas and the scholastics were on the defensive in Northern Italy after 1438. And to be sure 1438 isn't a watershed year, just a convenient marker and sign of the times. Thomism remained strong, e.g. at the old Italian universities. And others before Plethon took similar positions on Plato, I think, probably Traversari; but I need to do more research on this. Perhaps I am imagining things, but it seems to me that there might be a third level on this crown, at least in outline. I would very much like to know what church this is from and who commissioned it. All I can get on the internet is "Los Angeles County Museum of Art, Randolph Hearst bequest". I reply here to what you posted in another thread. * it has also been attributed to Agnolo Gaddi. 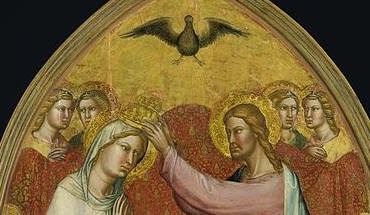 The Tiara is not uncommon as an attribute for the Holy Virgin, but this is an early example. Thank you for posting it! "“Fortune, Good and Bad,” illustration in Pierre Michault, MS Français 1654, 1466, French National Library, Paris — Source: gallica.bnf.fr".. The date of 1466, it seems to me, may refer to the script only, as manuscripts frequently left blanks for the illuminators to fill in later. But it would at least be in the same century. She is rather like the PMB Popess. I would caution that this is only one image out of many done of ladies with three-tiered crowns, with various meanings. This particular one is reminiscent of the "dame doctryne" of https://commons.wikimedia.org/wiki/File ... detail.jpg. There was much interaction then between England and parts of France, where the Anglo-Normans had ruled and lived for centuries. So perhaps the suggestion in the French illumination is that "good fortune" is for those who follow the Faith, and Bad Fortune for those that do not. This is a quarto volume, in paper, in handwriting of the second half of the fifteenth century. It contains poems by Chaucer, Lydgate and others (v. Skeat, Chance?-'' s Minor P. p. xliv. Trin : Legend of Good Women, p. xl. T. Skeat dates the MS. before 1500). The earliest possible date for the volume is fixed by a poem written by Geo. Ashby, entitled Prisoner in the Fleet, and dated 1463. Also, scholars today think that "Assembly of the Gods" was most likely not written by Lydgate (https://en.wikipedia.org/wiki/The_Assembly_of_Gods). Another lady with a three-tiered crown is this, c. 1475, in Norwich Cathedral. I get this from Nancy Black, Medieval Narratives of Accused Queens.